Well it was that time again, the time when my girls were due to get a good old pedicure, well in reality they were getting their feet trimmed. I had arranged for Robert and Mandy from Yorkshire Foot Trimmers to come over from West Yorkshire to take care of the task for me. The weather wasn’t great and although it could’ve been much worse, I hadn’t picked a nice day for it at all, as it was thick fog! I had already got the cattle into the pen ahead of them arriving and so once the trailer, gates and crush were all set up and in place, we were ready to get on with the job. That’s when I found out that all the confidence I thought I had with the cattle, wasn’t quite where it should’ve been. When you are in a small pen with the four of them, hoping to goodness that you aren’t going to get a horn up your rear, get kicked in the shins, or squished against the fence, it does take a great deal of courage to control them. So what we needed to do was once again get the cattle down the race, through a couple of gates and into the crush, which was sitting alongside the trailer. The thing is these cattle must get dizzy, the number of times I walk them through the same pen and race, round and round in circles I have taken them, so they get used to it. Yet, when anyone comes to visit, you can always rely on them to play silly devils and react in a completely different way. So, today they decided to go round and round in circles, but only around the pen, which wasn’t at all helpful. It didn’t matter how much encouragement they were given, how much they were pushed and prodded, or how many treats they were tempted with, if they didn’t fancy it, they were going nowhere! Eventually, Monica either saw sense or just got fed up getting dizzy and off she went, deciding that she was taking the lead and off she popped down the race and into the position, where she needed to be. The problem was that Lyndsey, in her wisdom, had followed very closely behind her and so we now needed to back her up a little and behind a gate into a separate area. Now I don’t know if you know, but reversing a moody cow through a couple of gates and back down a race, isn’t the easiest of challenges, but we managed it. 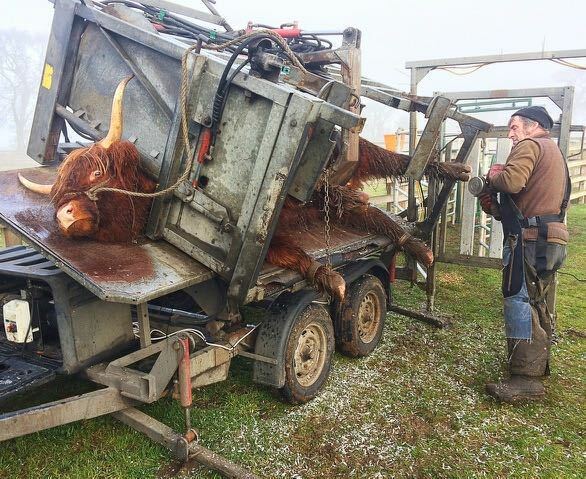 Before long, Monica was all strapped into the crush and was being lifted onto her side, on the back of the trailer. Whilst on her side she was able to relax, as much as a cow can in this alien environment, and the work could be completed safely on her feet. Their feet are in good condition, but you just need to keep on top of it so that they are looked after and kept healthy. It’s great to see Robert and Mandy in action, it is a real skill and it’s something I would never have even thought about in the past, trimming cow’s feet, why would you do such a thing, but hey it’s all part of the adventure. Before long they were back in the field. Things have definitely progressed for me though, since we arrived, because in the past I would have been sorely tempted to get the hoover out and give the field a once over, to clear up all those nasty nail clippings!